Number of inhabitants (1 Jan 2003): 27.858; area: 254,00 km². Settlements: Hulst (seat), Absdale, Clinge, Emmadorp, Graauw, Heikant, Hengstdijk, 't Jagertje, Kapellebrug, Kloosterzande, Kruispolder, Kuitaart, Lamswaarde, Nieuw-Namen, Ossenisse, Paal, Schuddebeurs, Sint Jansteen, Terhole, Vogelwaarde, Walsoorden, Zandberg. In 1970 the municipalities of Hulst, Clinge, Sint Janssteen and Graauw en Langendam merged to form the new municipality of Hulst. 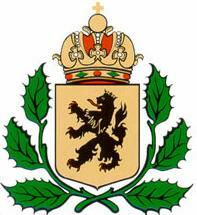 On 1 Jan 2003 Hulst and Hontenisse merged to form the municipality of Hulst. Via the Benevex-list Hans van Heijningen and Mark Sensen reported the new flag of the new municipality of Hulst, after the merger with Hontenisse. Hulst is in Zeeuws-Vlaanderen, the southern part of Zeeland province. The present flag is: yellow with in the center a black crowned lion, tongued and nailed red. This flag was adopted by municipal resolution on 22 Jun 1956; after the municipal reorganisation of 1970 of it was (re)adopted 25 Jun 1970 by the new municipal council. Two new designs were presented to the municipal council on 13 Nov 2003. The definitive choice was to be made during the meeting of 18 Dec 2003. Source: the Hulst municipal website. Granted 30 Jun 1970. On 27 Mar 2003 the new municipal council decided to retain these arms.